Tasty treats couple chewy nutritious sweet potato with crunchy delicious 100% natural chicken breast. These playful snacks are ideal for fun and loving dogs because they are high in antioxidants, vitamins, and minerals. 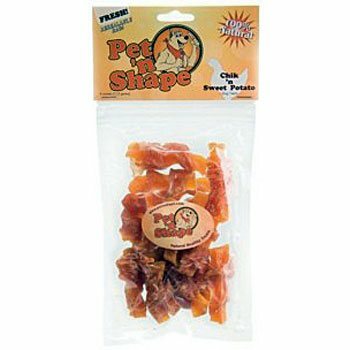 Pet n Shape natural chicken treats are made from 100% natural chicken fillets. Each highly nutritious treat provides your dog with a high-protein, low-fat, natural and healthy snack. They contain NO additives, NO preservatives, and NO coloring. Each treat is carefully roasted to ensure the ultimate quality and flavor.